After capturing four young turtles with hand nets from kayaks, field school participants paddled eastward to Mill Hill Island to search for signs of nesting. 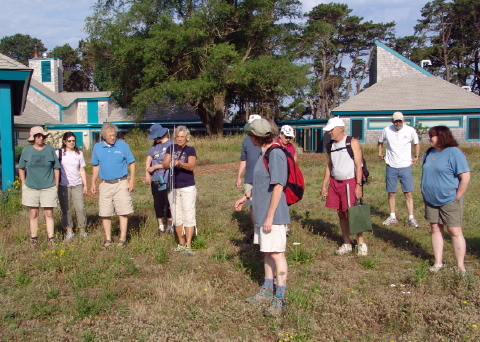 In this area where terrapin nests had been documented in 2000 and 2001, they discovered more than five fox dens, several of which had been recently active. 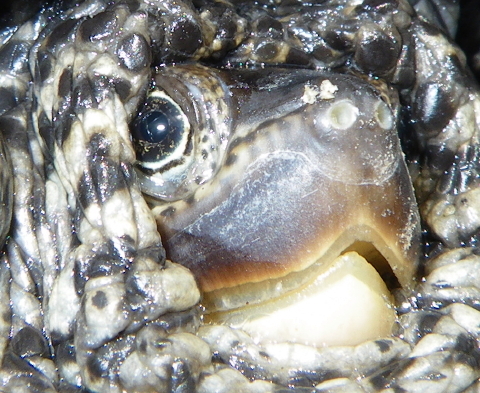 No active terrapin nests were observed. 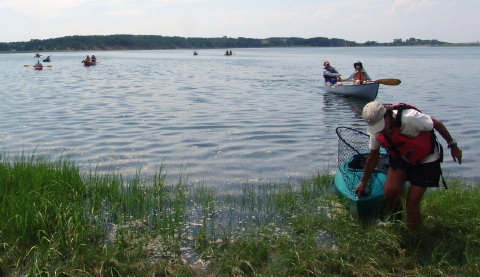 Kayaks and canoes offered many choices for participants to experience a completely different aspect of turtle research. 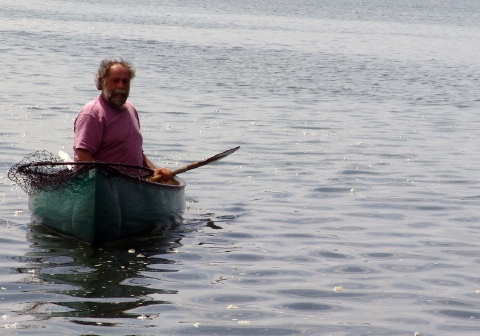 With Loagy Bay water temperatures soaring, terrapins moved wtih the quickness and speed of a submerged race car. 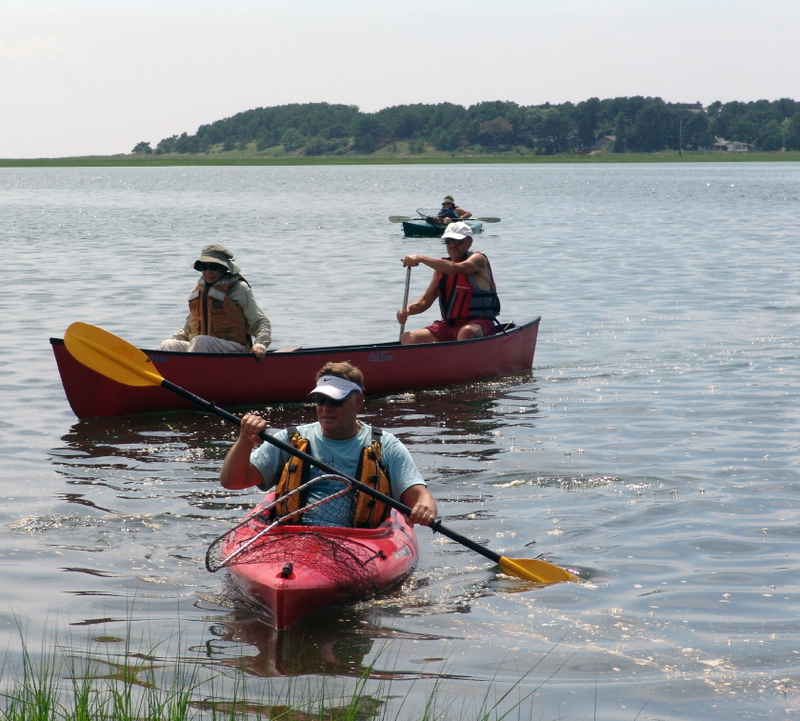 Mass Audubon Naturalist Dennis Murley oversaw the motley flotilla of kayaks and canoes to ensure that everyone stayed safe while enjoying a great natural experience. After processing and documenting four captured terrapins, several of the team relaxed on the iconic Lieutenant Island Bridge for a group photograph … with one of the turtles, of course. 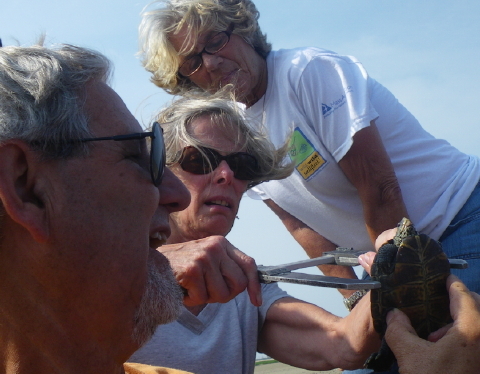 All four terrapins were released back into Loagy Bay under the bridge. 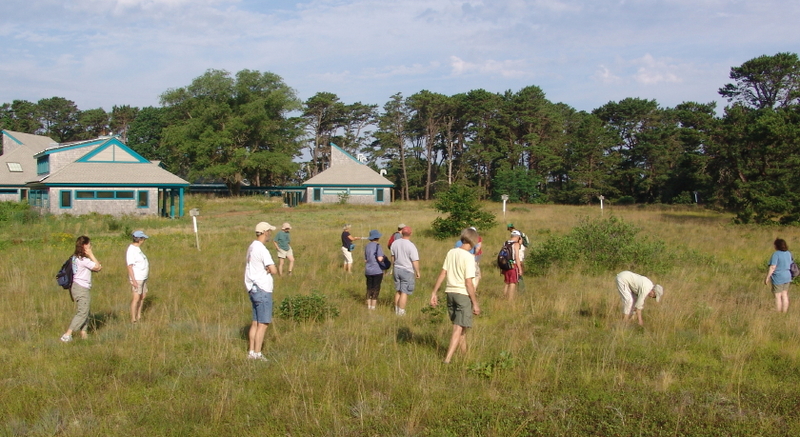 The second day of the Turtles of Cape Cod Field School began with radio tracking tagged Eastern box turtles on Mass Audubon’s Wellfleet Bay Wildlife Sanctuary. The sanctuary hosts one of the more robust populations of Eastern box turtles in the state, and under the leadership of Director Bob Prescott, the sanctuary has conducted a 31-year longitudinal study of Eastern box turtles in the South Wellfleet area. 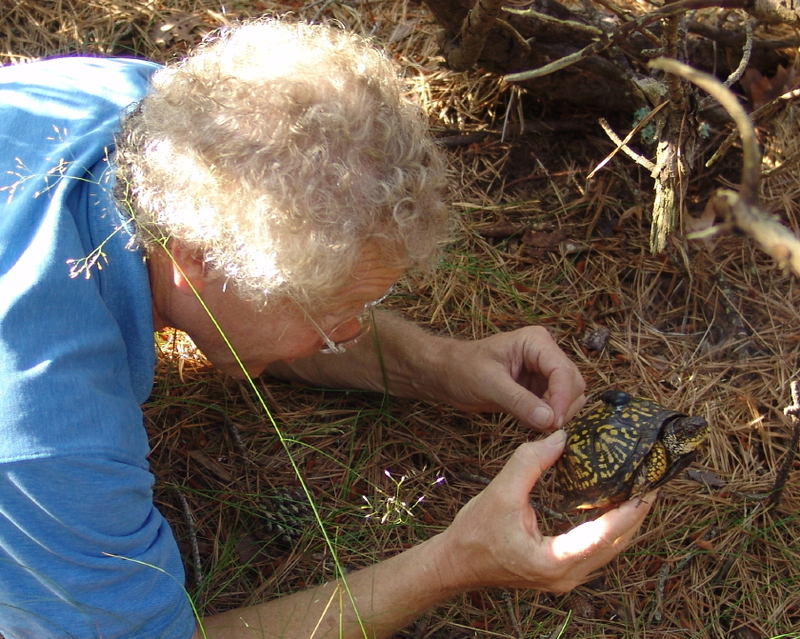 Following a brief tutorial, Bob Prescott brought participants into the field on a glorious summer day to find a female Eastern box turtle that he had tagged the night before. This turtle had been found by the field school on Monday roaming through the parking lot looking for a suitable place to nest. Handing over the antenna and radio direction finding equipment to first one student and then another, the search began in the field adjacent to the Nature Center and the camping grounds. After a little good humored ribbing from the instructor and ample “return fire” from students, the tracking signal was acquired and the game was a-foot. 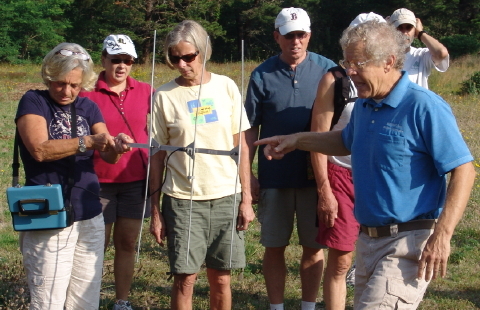 Participants spread across the field in the direction of the sanctuary camping grounds, hand-checking every possible turtle hiding place in the line of bearing from the radio receiver and pointing off to the east-northeast. With able instruction, both in the classroom and in the field, students closed in on the turtle, getting a powerful signal under some leaf clutter beneath a low oak tree. Bob Prescott crawled on his hands and knees to the perfect turtle spot and eyed the transmitting antenna protruding from a pile of leaf debris. 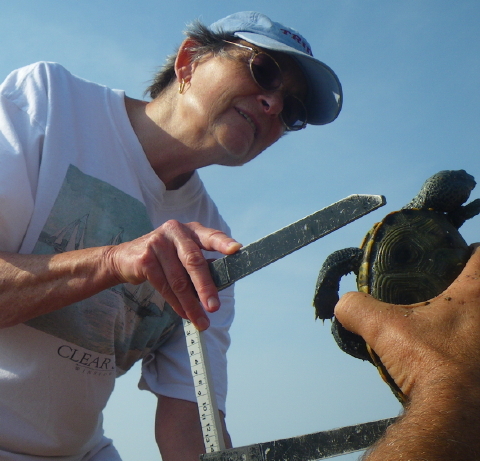 After locating this turtle, students turned their attention to another tagged turtles on the eastern edge of the sanctuary, finding this one and four more untagged Eastern box turtles during the morning expedition. Day One of the 2010 Turtles of Cape Cod Field School kicked off with a fine start as six terrapins and one box turtle were captured by participants. 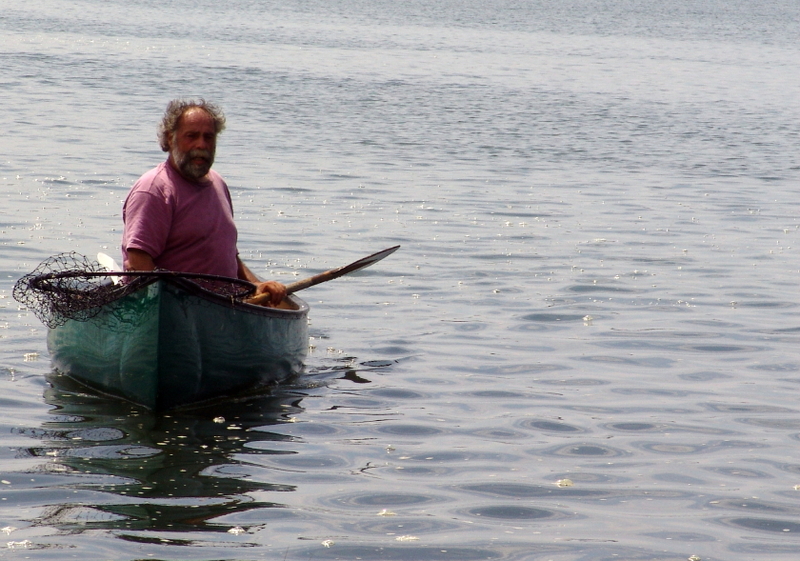 The morning started with an expedition to the Run to search for juvenile diamondback terrapins. 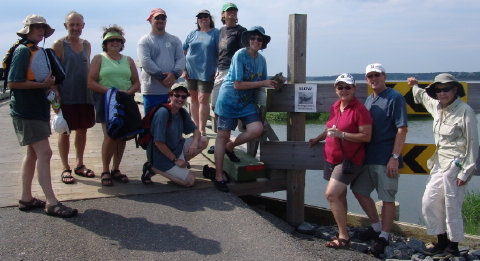 But as field school participants meandered along Goose Pond Trail to reach the bay, they encounterd female Terrapin #1043 just completing her nest by the Observation Deck. 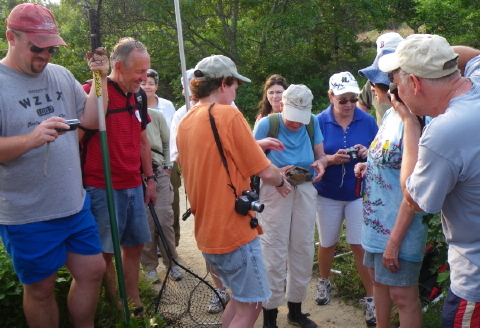 Students watched as the turtle danced down the last few pats to finish off the nest. 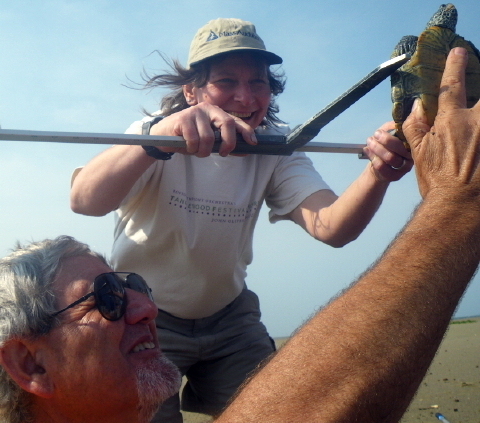 After she completed the nest, student scooped up Turtle 1043 to record her latest measurements and weight, and then turned their attention to her eggs and the nest which they protected with predator excluder cage. Sue Wieber Nourse scored the first capture of the morning with a beautiful female juvenile terrapin. 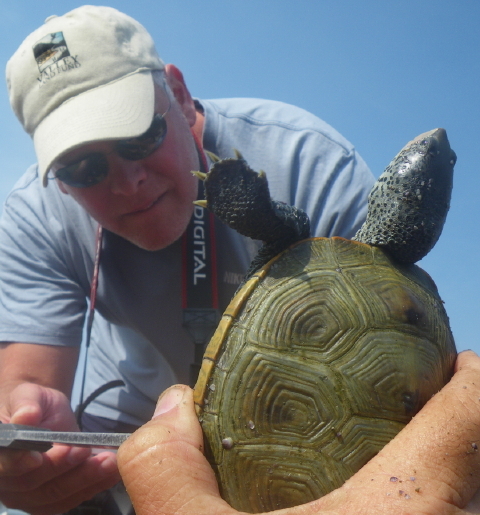 Matt soon followed with the capture of the only male terrapin of the day. 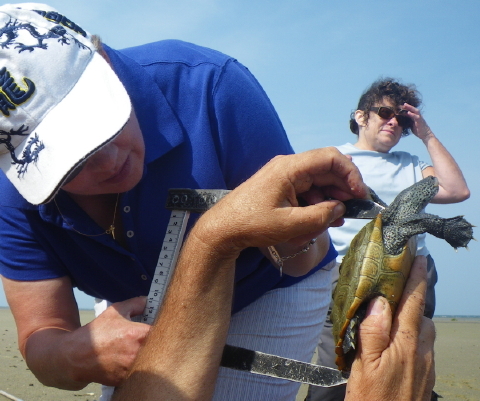 Before everyone turned their attention to processing and documenting captured turtles, they took a few moments to admire the juveniles and to snap some pictures of the experience. 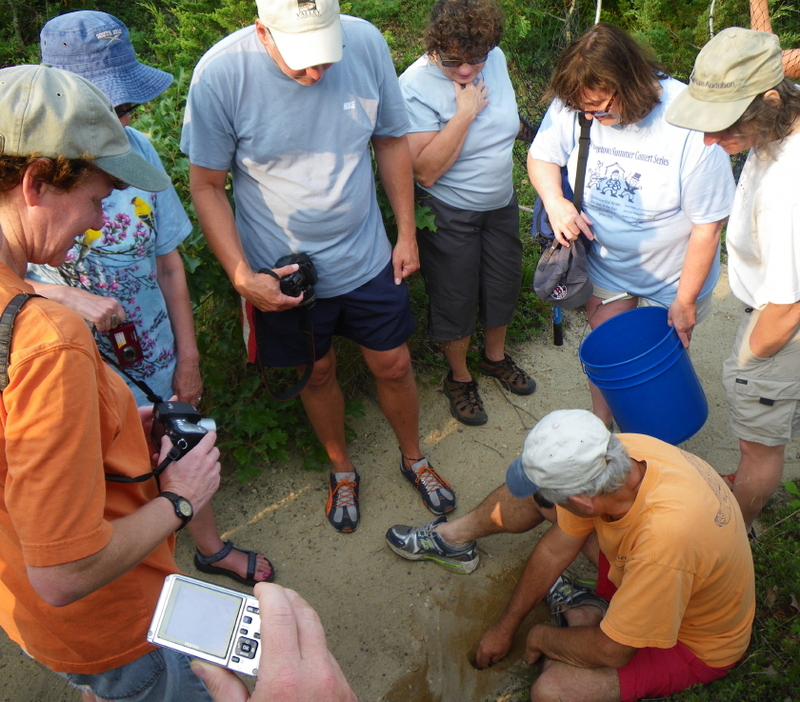 Field School Has Fun with Calipers! 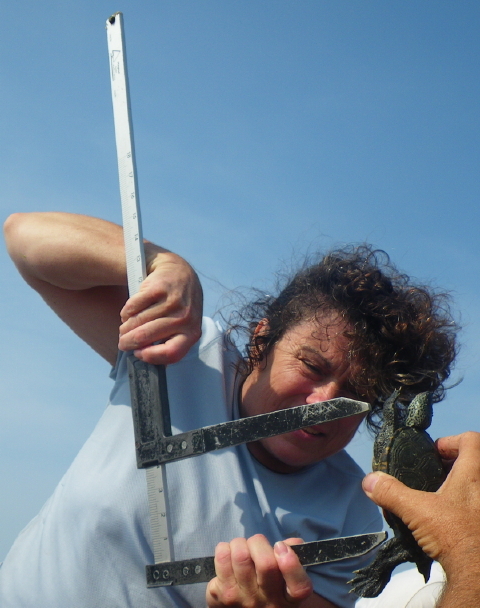 But if you really want to have fun, pass around a very large set of calipers to measure these diminutive terrapins! A great beginning to another exciting Turtles of Cape Cod Field School. 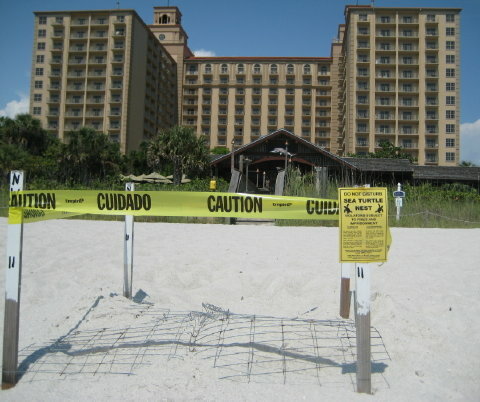 Loggerhead Nest at Naples Ritz-Carlton Hotel — Good News from Florida’s Gulf Coast! Every morning paper, every evening news broadcast, and every hourly update bring more reports of the horrible devastation along the Gulf Coast as millions upon millions of gallons of oil attack fragile salt marshes, threatened estuaries and critical coastal habitats from Louisiana to Florida. But an email arrived at Turtle Journal headquarters last Tuesday about a good news event at the Ritz-Carlton Hotel in Naples, Florida. 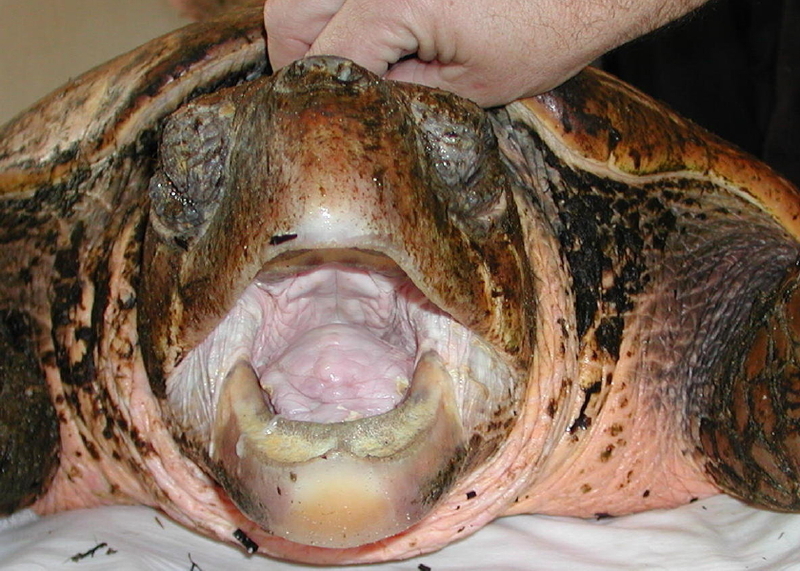 A loggerhead sea turtle had chosen the pristine beach in front of the resort to deposit the next generation of this threatened species whose population has been in rapid decline. Turtle Journal loves the Ritz-Carlton in Naples, Florida. During visits to Florida’s Gulf Coast we often document the many marine species that we study along Vanderbilt Beach in front of the hotel. 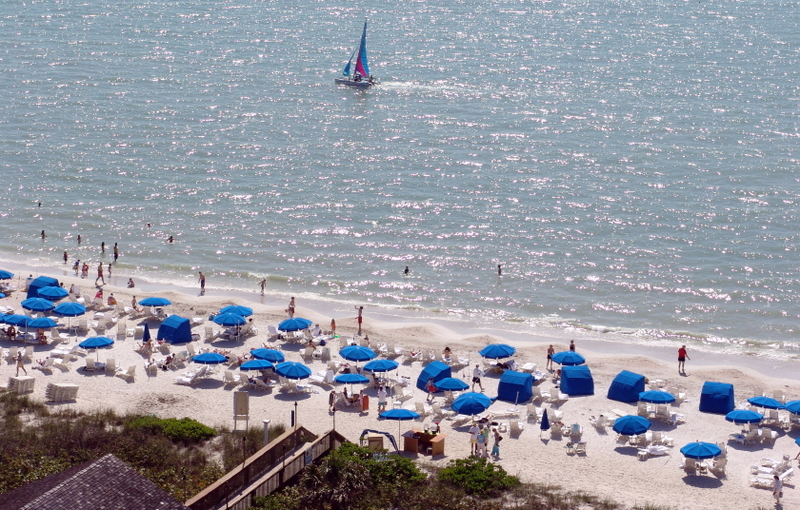 This picture of the Ritz-Carlton beach was shot from our 11th floor room during a recent visit. 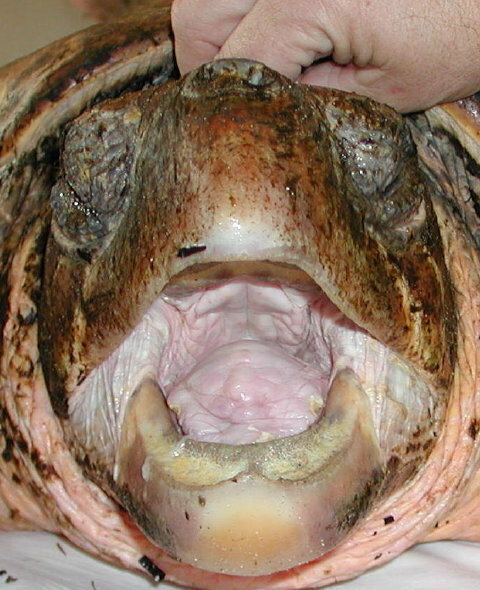 Of course, the loggerhead sea turtle has a very different perspective of the Ritz-Carlton. The nest she dug in the perfect beach sands in front of the hotel provides an interesting turtle’s eye view of the resort. She certainly didn’t realize what a lucky choice she made for her offspring. 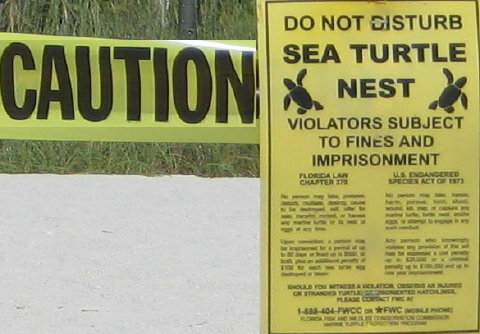 Once staff discovered the loggerhead nest, protective tape, caging and signage were posted to keep the eggs safe while they incubate in the warm Florida sand. These eggs are expected to hatch sometime around July 29th. 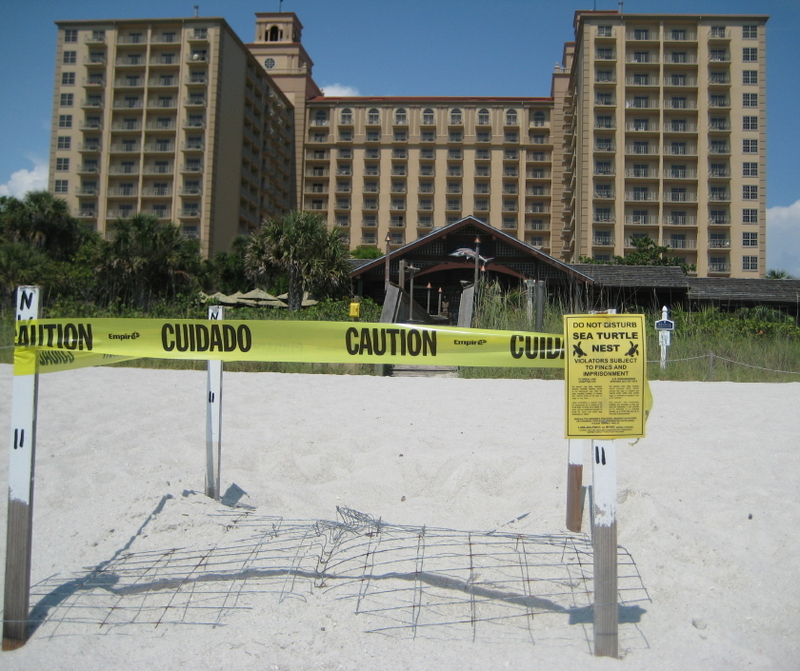 As the hatching date approaches, the Ritz-Carlton Hotel plans to organize “turtle sitting” events for guests to watch and wait for the tiny hatchlings to burrow through the sand and scramble into the gulf. 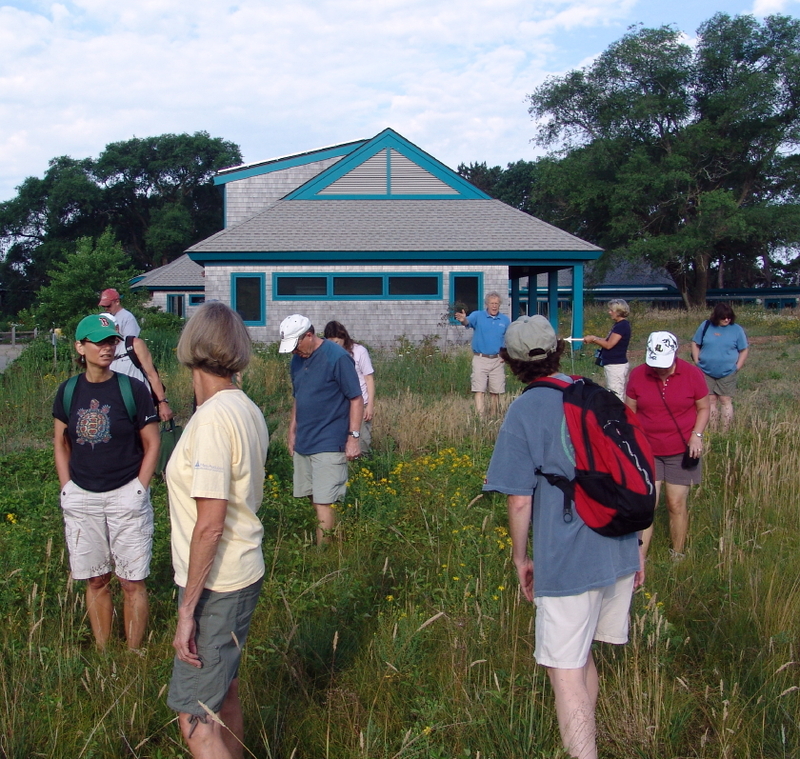 The center for these discovery events will be Nature’s Wonders. 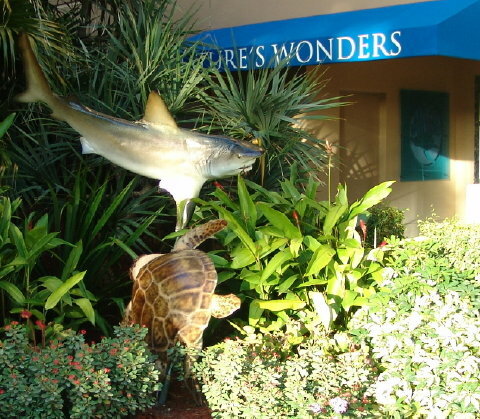 Learning more about sea turtles and the rest of Vanderbilt beach’s marine life is only a few steps away at the hotel Nature’s Wonders, an exquisiste learning center under the capable leadership of Ranger Randy Sarton. 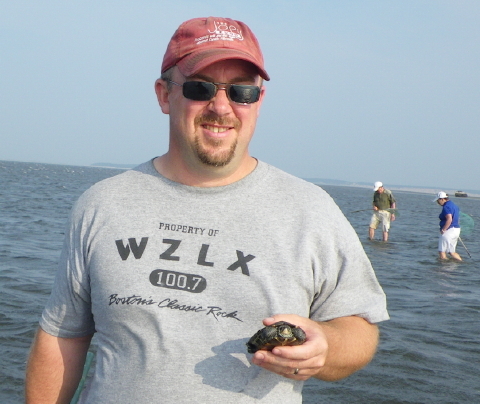 Turtle Journal never misses an opportunity to re-visit Nature’s Wonders and catch up with Ranger Randy every time we travel to Florida’s Gulf Coast. 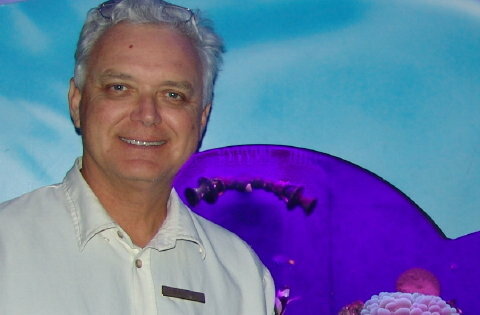 Randy Sarton will teach visitors more about sea turtles every Saturday at 5:15 pm within the Nature’s Wonders Center. 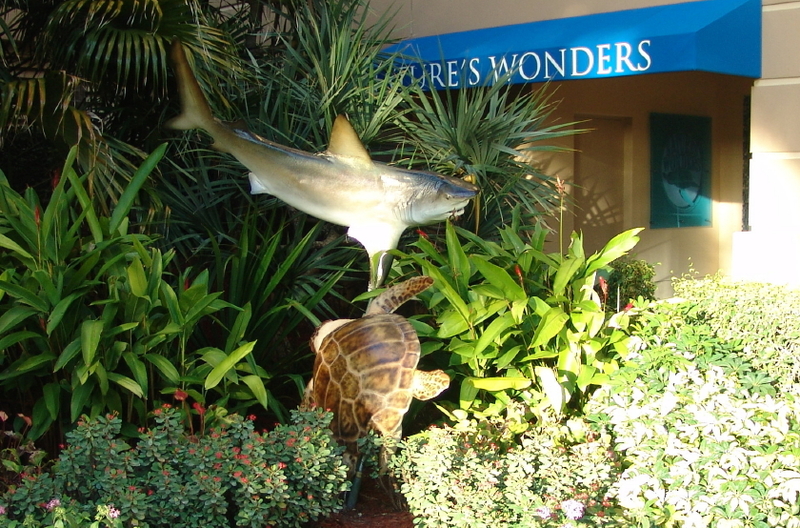 Loggerheads are not the only turtle species that deserve mentioning at the Ritz-Carlton Hotel in Naples. 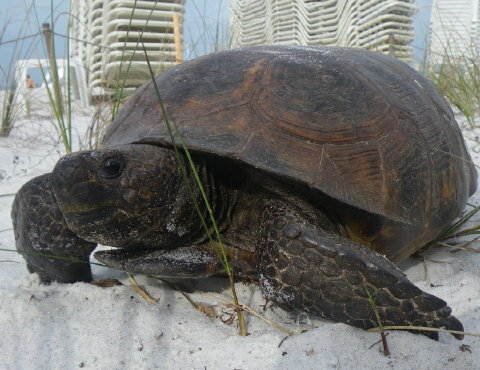 Some of the luckiest gopher tortoises in the world have staked a claim to the most expensive beach front burrows on the planet. Since gopher tortoises are also a threatened species, the hotel staff takes special care to ensure they are protected in their beachside habitat. 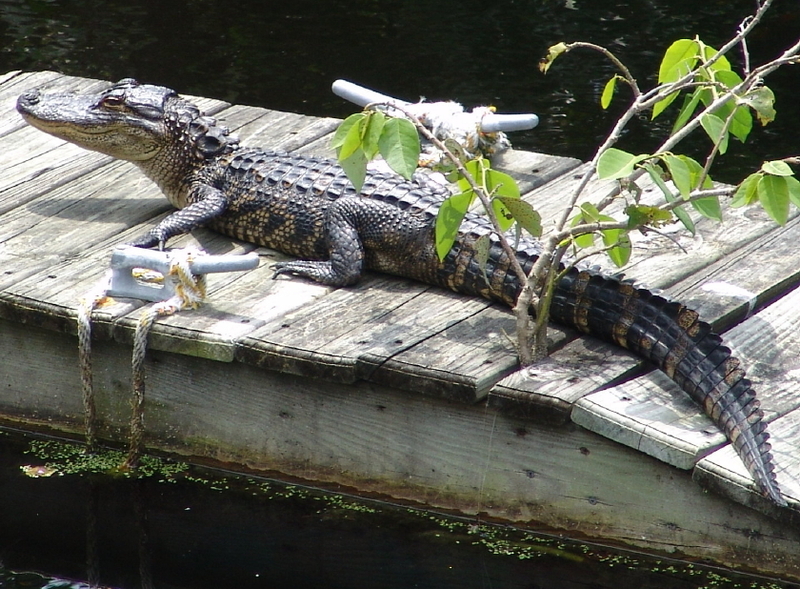 One of the first guests we met on our initial stay at the Ritz-Carlton was this friendly native who spent each morning sunbathing (a.k.a. basking) beneath our balcony overlooking the gulf. For more information about this magnificent location to observe Gulf Coast marine life, see Feisty Gopher Tortoise on Prowl near Ritz Carlton Gulf Coast Beach Resort, A Walk on the Beach — Southwest Florida Style, Lone Male Tortoise Struts Vanderbilt Beach, Turtle Journal Arrives in Southwest Florida, Gopher Tortoise Crashes Ritzy Beach Party in Naples, Florida, Large Aggregation of Cownose Rays off Vanderbilt Beach in Southwest Florida, Nature’s Wonders — Ritz-Carlton, Vanderbilt Beach, Naples, and Gopher Tortoises “Puttin on the Ritz” in Naples, Florida. 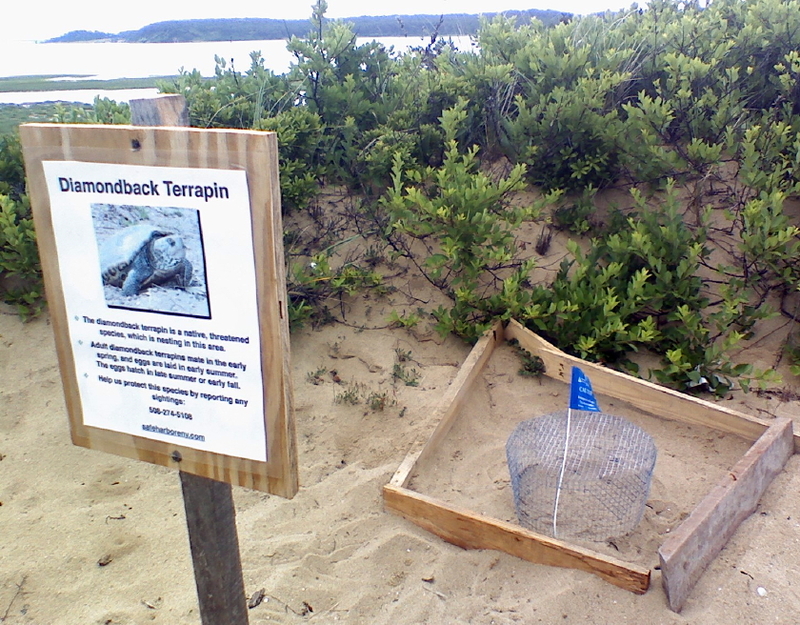 Crews at the Blasch Del Mar construction project at the end of Chequessett Neck Road in Wellfleet saved another threatened diamondback terrapin nest last weekend. 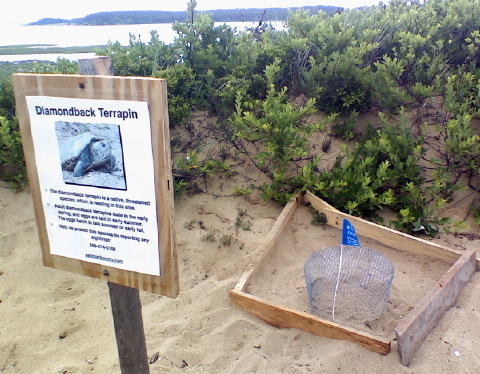 In the three seasons this project has spanned, crews at the site have saved at least one terrapin nest each year and have protected numerous turtles from tourist vehicles turning around at the site. 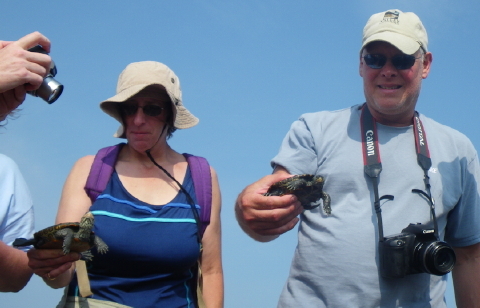 The entire project operates under a state-approved Turtle Protection Plan, but the crews have reached out beyond the boundaries of their project to ensure that these endangered turtles and their nests are protected. The construction crew spotted a turtle wandering back and forth across the asphalt road in front of the project. The worker installing the alarm system in the new home called the Turtle Journal 24/7 hotline to alert us. 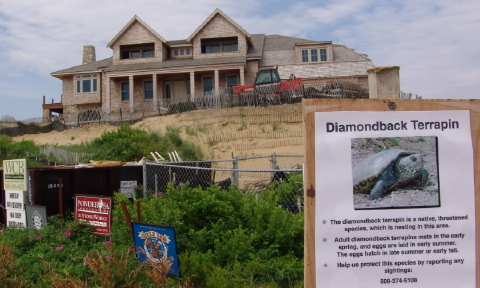 The builder watched as the turtle began digging a nest just beyond the asphalt road and a couple of feet east of the public footpath to the bay. Once the turtle had finished her nest, the crew sped to the site and constructed a wooden box around the nest to ensure that vehicles and walkers stayed clear of the fragile eggs. 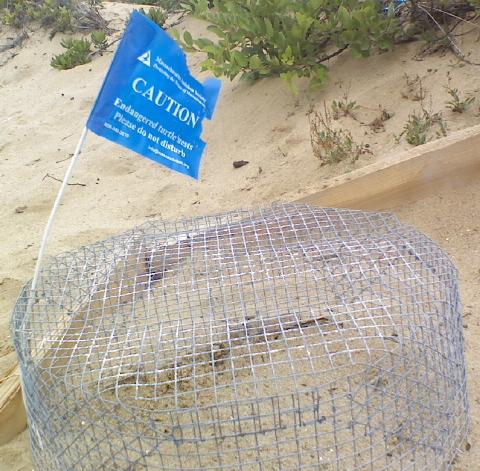 Turtle Journal arrived later to document the nest and to install a predator excluder. Unfortunately, the only camera I had on hand was my cell phone. 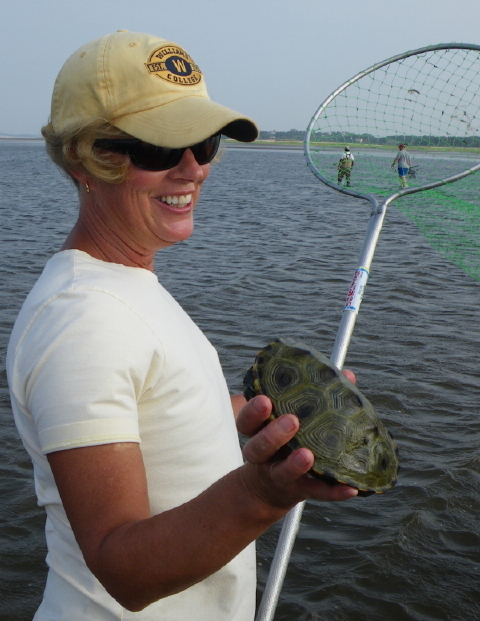 Crews at the Blasch Del Mar project have saved other terrapin nests in 2008 and 2009, yielding more than thirty live hatchlings as recruits to the Wellfleet Bay population. 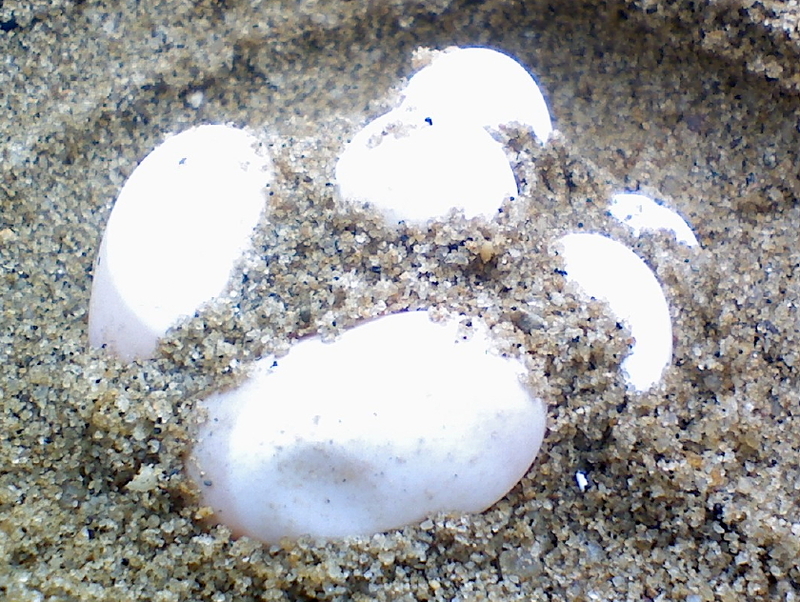 With warm sunshine through June and July, we can expect these eggs to incubate well and hatch sometime in mid-August thanks to the vigilant actions of the Blasch Del Mar construction team. 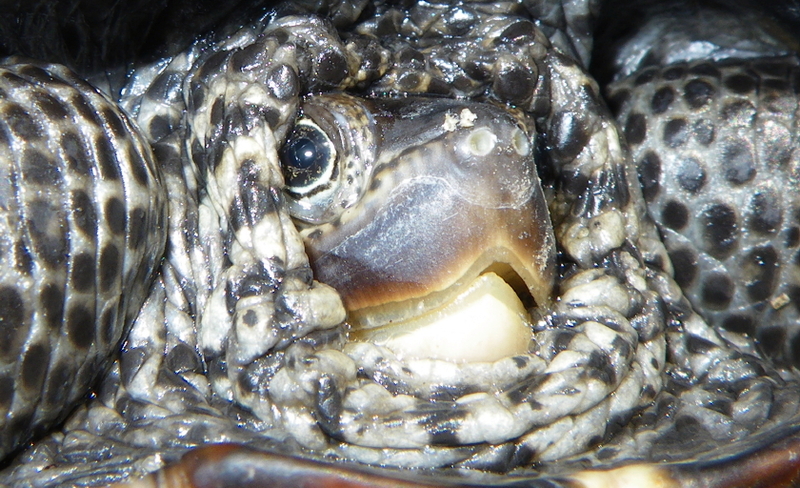 You are currently browsing the Turtle Journal blog archives for June, 2010.